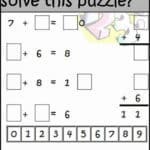 Challenge your students to truly understand their math facts with this Addition Facts Tiling Puzzle. Students can only use each number tile one time, so they must really think about what each problem could be. These puzzles are great for modeled think alouds as well as a way to challenge early finishers. Download this free puzzle from my Teachers Pay Teachers store.